On Good Chef, Bad Kitchen , professionals take on the ultimate challenge: Cooking in a bare, millennial kitchen. 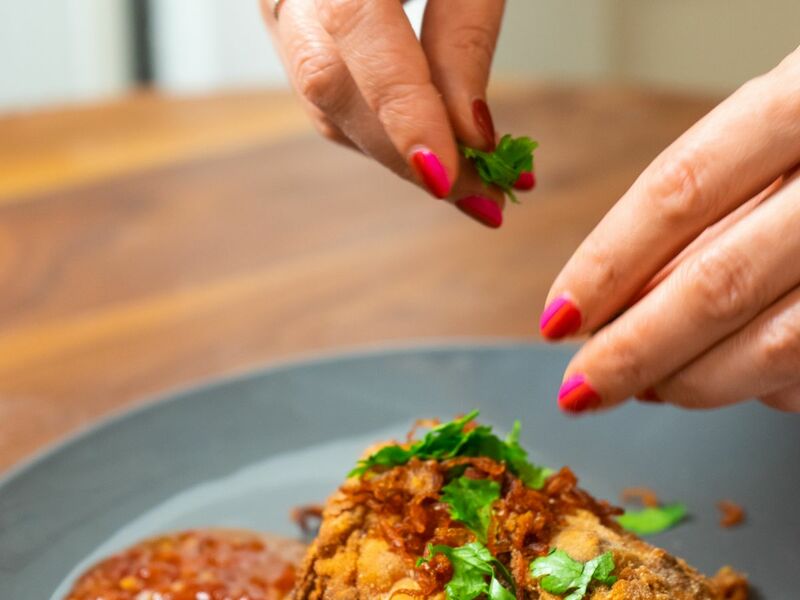 In this episode, chef Leah Cohen of New York City’s Pig & Khao shows us how to make her Thai fried chicken — despite somewhat dangerous circumstances. If you’re like me, deep-frying anything is A-level scary. Like, horror movie, run-and-hide, please don’t burn the house down scary. But for Leah Cohen, chef of Pig & Khao and former Top Chef contestant, this was just another day in the kitchen. “This is probably the smallest pot I would go with for frying chicken,” Cohen says of the pot she worked with in the video. It was still so small, she could only fry one piece at a time. 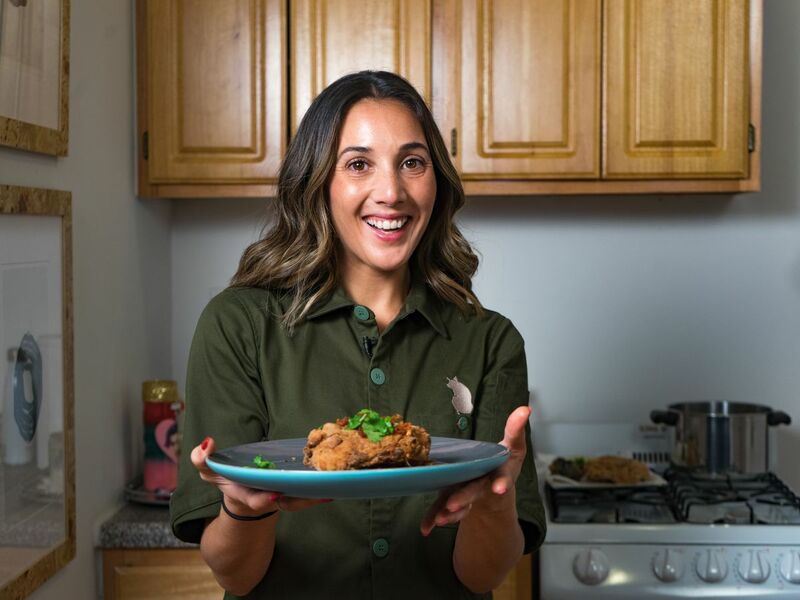 Cohen used two forks to turn the chicken — turning the piece away from her to avoid getting oil splattering on her — and also to lift out the chicken. Still, this posed some risk — if the chicken dropped, it would splatter oil at 350 degrees F, which could hit her hands or her face. “What you want is either a slotted spoon or tongs to carefully take out the fried chicken from the pot,” Cohen says. Even Cohen admits that getting the temperature right is tricky to eyeball. “If it’s too low, the coating can come off. If it’s too high, you could smoke out your apartment, which is not ideal,” she says. Still interested in making this? Get the recipe below. 1. To marinate the chicken, start by slightly scoring the chicken so the marinade can get into the meat. 2. In a mortar and pestle, pound together the garlic, coriander seed, white pepper, and cilantro root with a pinch of salt until you get a paste. 3. Mix in the remaining ingredients (fish sauce, oyster sauce, sugar, and msg). Then rub the marinade into the chicken and let sit 6 hours, or overnight, in your refrigerator. 1. Once the chicken is done marinating, get your coating together. In a large bowl, pour in one cup of the rice flour, salt, mushroom powder, and baking powder, if using. 2. Whisk in the limestone water or seltzer, until the batter is the consistency between a pancake and crepe batter. 3. Pour out the remaining two cups of rice flour in a pan. Coat your chicken in the wet batter, then coat in dry flour. Let sit uncovered for 30 minutes. 1. Heat up your oil to 300 degrees F. You want to make sure there is enough oil in the pot to cover the chicken, but not too much oil where it will overflow the pot after placing the chicken in. 2. Once the oil is heated to 300 degrees F, knot the pandan leaves together and carefully place them in the oil to flavor it. 3. Fry the chicken until cooked, approximately 6 to 8 minutes, and carefully remove the chicken from the fryer, using tongs. If you need to turn the chicken, turn the chicken away from you, not towards you, to reduce the risk of splattering. 4. Turn up the heat to 350 degrees F, and fry until crispy, 2 to 3 minutes. 5. Remove from oil and drain on a paper towel. Garnish with crispy shallots and serve with sweet chili sauce.